Aloe vera is a versatile and popular herb because of the wide range of benefits it provides, from healing and soothing external skin ailments, to helping your digestive system. Eaten by itself, aloe vera pulp has a rather bitter flavor, but aloe vera juice can be added to any number of recipes, from smoothies to yogurt, to mask the taste. If you have your own aloe vera plant, make aloe vera juice to have on hand for drinks and other recipes. 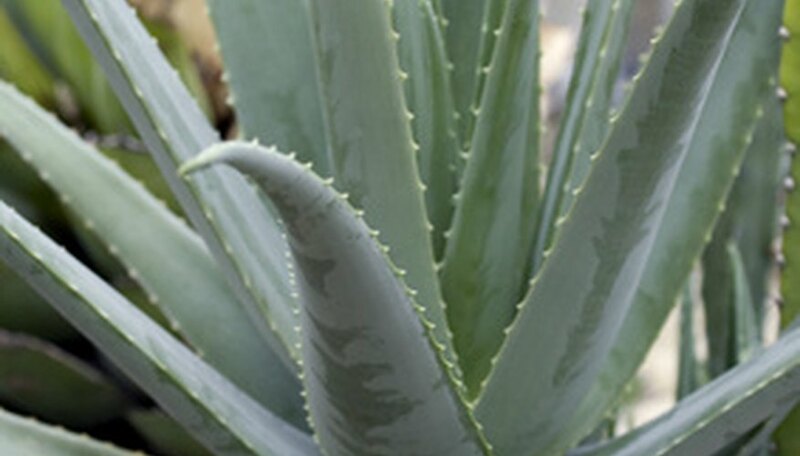 Cut off two or three large, pump aloe vera leaves at the base of your plant with a sharp knife. This will not harm your aloe vera plant. Cut each leaf along the outside edge so that it opens up and lays flat, as if it were filleted. Scoop out the clear gel pulp from the inside of the leaf with a spoon. Be very careful not to scoop out any of the green or yellowish colored gel. The colored gel is much more bitter than the clear gel and may cause nausea if digested. Place the clear gel in your blender. Add 1 to 2 tbsp. of citrus juice to aid in the flavor of your aloe vera juice if you plan to add it to smoothies, tea or other drinks. For use in salad dressings, yogurts, puddings and other desserts, you may wish to omit the citrus. Run your blender with the aloe vera gel on medium speed for two to three minutes to liquefy it. Pour the liquefied aloe vera juice into a glass jar and secure the lid. Place the jar in your refrigerator for at least two hours to overnight before using your homemade aloe vera juice. Strain your aloe vera juice through cheese cloth before cooking with it to remove any large chunks of pulp. Your homemade aloe vera juice will keep in your refrigerator for up to a week. You can also add an equal amount of water to the concentrate in the jar to increase the amount, particularly if you are using it as an ingredient for drinks. You can also add granulated vitamin C and E to your juice when you blend it in the blender to increase the benefits.